Blog: The cooling tower basin serves two functions: it collects water and acts as a structural support. Therefore, no weakening influences can be allowed, neither in the water or the basin structure. Basin painting provides a shell-like finish, one that stops rust from compromising this deep pan. Although designed to collect water, the basin also catches other materials, including unhygienic pollutants that accelerate corrosive action. Fiberglassing works alone or as part of a galvanised steel housing. The reinforced plastic resin won’t rust, won’t allow brackish water to deposit ‘scummy’ film, and it won’t abrade when tough environmental conditions are part of the setup. Indeed, the chemically inert plastic is highly robust and ideally suited for this fluid-saturated application. Maintenance strategies that encourage basin painting and fiberglassing of cooling towers are classed as preventative measures. 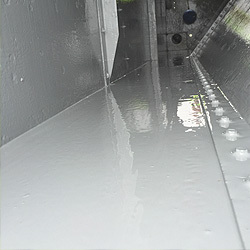 Fibreglass-reinforced housings provide a cost-effective alternative to exposed metal, as the treatment serves to protect plant equipment around the clock.